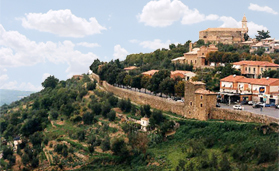 Once an important Sienese stronghold, Montalcino is now rich in historical monuments and Medieval art work. We’ll make our way through the tiny streets of the city, admiring many important sights along the way. We couldn’t possibly leave Montalcino without tasting some of the world-famous Brunello wine accompanied with pecorino cheese, Tuscan salame, ham and bruschetta. We'll continue on to the Abbey of Sant’Antimo, an important example of Romanesque architecture in Tuscany.